An aggressive evening and game for the Quake didn’t end in a Clipper win but still provided some come-to-expect highlights and a double double. 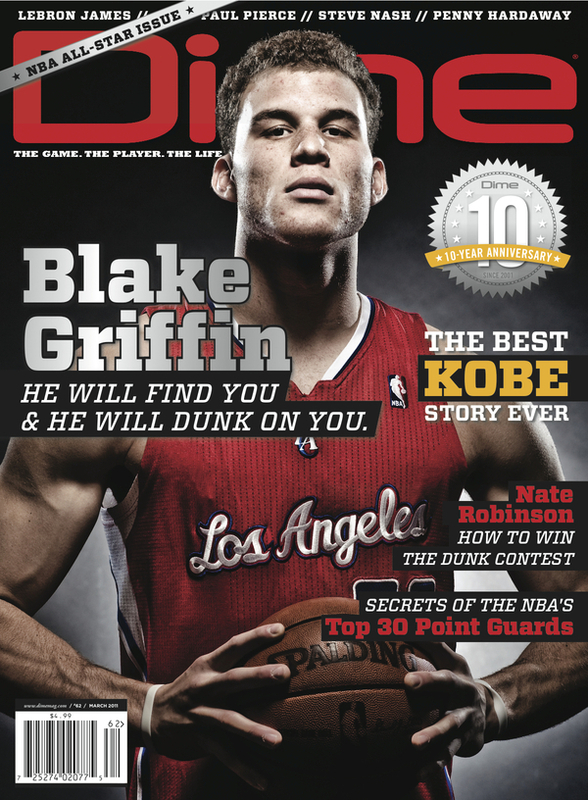 Then – possibly the most underrated Blake dunk to date. Baron “thanks for saving my career, I owe you one” Davis nonchalantly throws an amazing oop from half court and Blake has the body control/ups to jump-reach for the ball-and flush it down with his left. Last but not least, here is the play people are talking about today. At the end of the game Al Horford takes it hard to the rack and Blake contests him straight up. Let’s break this down briefly. Al Horford upon instant BQG impact goes down faster than Vince Carter on an average sprained ankle play. This looks like he’s been hit in the 80’s by Laimbeer or something. Nope – it’s just that Blake is built like a linebacker and you can’t bring that weak stuff into his house. Nuff said. Remember that you can order your Quake T-Shirts Here NOW! As announced on TNT and ESPN Blake “Quake” Griffin has made the Western Conference reserves in his first full-season in the NBA. The Clippers recently posted an official press release and the world is buzzing for what this man is going to bring to rejuvenate the All-Star weekend as a whole. Ok so not really, “lately” but if you haven’t read how Blake Griffin makes Rey-Rey feel over at The No Look Pass, you should. Blake Griffin the best Clipper of all time? Yes? No? Maybe so? What do you think about this debate happening so early Clipper fans? How will Blake fair with sharpshooter sidekick Eric Gordon out with a wrist injury? Is your wall at home empty? If it is, I have something you might want. If you live in Toronto and are a Blake Griffin fan, you do worse things with your last hour at work on Friday then enter this contest to see him in person. Chatting Clippers, and of course Blake Griffin, is Lisa Dillman of the L.A. Times. The good news is the x-rays were negative and Blake said he’s fine and should be able to play. No, that’s not a flagrant foul,” Haywood told ESPNDallas.com’s Jeff Caplan. “I feel the NBA should give my money back for that one. It was one of those plays, I just grabbed his arm. He’s just so athletic and strong that he was still trying to finish the play and he ends up basically not protecting himself. “On those type of plays he has to realize, ‘All right, I got fouled, just throw it at the rim and come down.’ Protect yourself for the next play. Every play can’t be a dunk-contest dunk. On a scale of “1 to Mozgov” this is what, a 2? Tremor: "Forget the Truman Show, It's the Blake Griffin show in Dallas"
I also heard on Twitter last night that Blake was a trending topic in the Dallas area. Talk about taking over the NBA! So for those of you who follow me on Twitter, I got a little crazy on Saturday during the game and ended up retweeting just about anything mentioning Blake Griffin’s awesomeness. Which was just about everything on Twitter for those who follow the NBA. My apoligies for my Twittershock that resulted from his crazy reverse alley-oop and stuffed stat line of 30-18-8. It won’t happen again. (Until he does something crazier than posterizing Mozgov. Hope LeBron, Wade and Bosh enjoyed the LA night life… Blake Griffin just punk’d that 13 game win streak… It’s hip to Clip!!! @timandsid Quake Griffin. Dudes sends out shockwaves whenever he dunks. I have watched parts of 6 #Clippers games in the past 2-3 weeks and Quake Griffin is sucking me in. He’s impossible to not love. There are two kinds of people in this world. People who are Blake Griffin and people who are going to die. If Blake Griffin & Chuck Norris where walking towards each other on a sidewalk, Chuck Norris would cross the street to the other side. 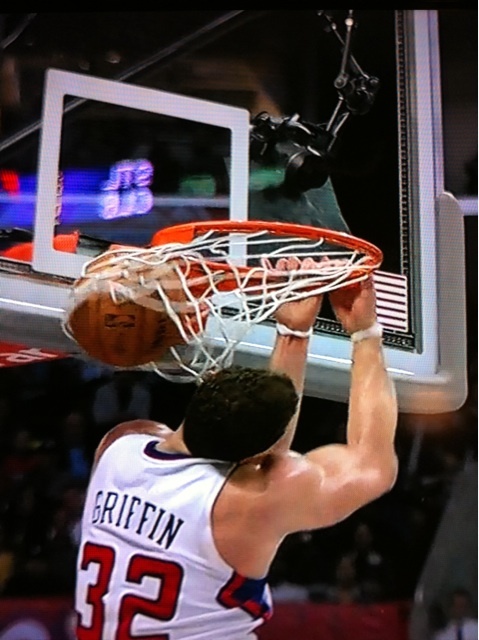 Sportscenter should just lead with that Blake Griffin reverse dunk tonight. And play it for 60 straight minutes. @snghoops @HPBasketball Blake Griffin will take down SkyNet. With dunks. Can we just go ahead and change all Chuck Norris jokes to Blake Griffin? It’s only fitting. Blake Griffin in Big D. Last time I paid attention to clippers here I think was…never. Rick Carlisle said Blake Griffin reminded him of a Karl Malone/Charles Barkley mix. “Which is pretty good,” Rick said. Of course the answer to this is simply to come visit quakegriffin.com everyday. The Blake Griffin star and corresponding story will not be stopped! Yesterday I pointed out that just about every single one of my favorite NBA writers has written a Blake Griffin piece in the last two weeks. Not to mention all of the big name papers and more traditional news sites. Well even more of the great NBA writers have joined the Blake Griffin coronation party and none did I enjoy more than Zach Harper’s piece over at Harwood Paroxysm. You must go read the whole thing. Anthony Macri, aka @CoachMacri, over at Hoopsworld, has an excellent breakdown on Blake. If you: like collecting Basketball cards, are a Blake Griffin fan, want one of his rookie cards with a jersey or an autograph, then get ready to open WIDE you wallet and take out a second mortgage. Kurt Helin at ProBasketballTalk says he’d rather buy a couple of waterproof pool table. Credit Sports Illustrated for correctly identifying Blake as Blake “Quake” Griffin in the mid-season awards. A handful of the best NBA beat writers answer the question: Will Blake Griffin be a true NBA superstar or just another really good player? Will Blake be picked by the coaches as an all-star? Ken Berger says no even though he deserves it in today’s Friday 5. Carl Bialik at the WSJ’s Daily Fix takes a closer look at Blake’s defense. Just another area he can get even better than he already is. Making predictions for the second half of the season, Mitch Lawrence at Fox Sports says Blake Griffin is good enough to get the Clippers to make a legitimate playoff push.